The Telugu states leg of PKL will be played from December 7 to 13 in Visakhapatnam. 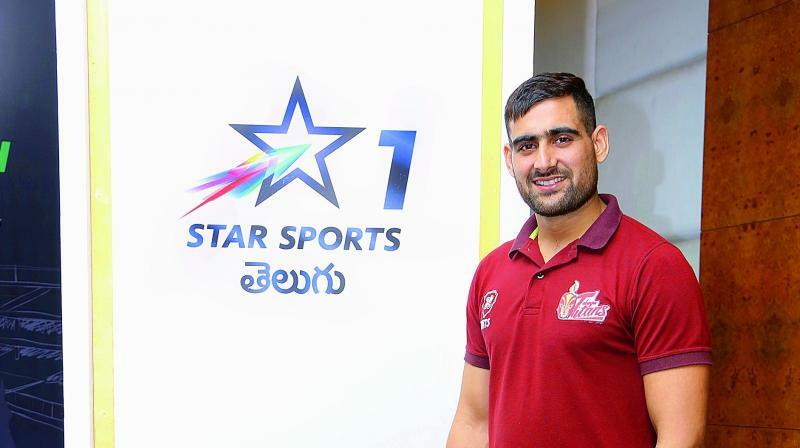 Rahul Chaudhari of the Telugu Titans kabaddi team poses at the channel launch in Hyderabad on Wednesday. Hyderabad: Leading sports broadcaster Star Sports on Wednesday announced the launch of Star Sports 1 Telugu, a dedicated channel for sports lovers in their mother tongue. The channel will offer multiple sporting events in Telugu, starting with the upcoming Pro Kabaddi League (PKL). Providing live and non-live content, Star Sports 1 Telugu will have onboard commentators and players building a strong compelling offering for Telugu speaking sports audiences. Team Telugu Titans raider Rahul Chaudhari was overjoyed. “Over the past few seasons we have received immense support from fans in the region, they have cheered for Telugu Titans and been there to support us for every match. The affection we receive in the region has been unmatched so far. I thoroughly enjoy watching sports in Hindi, and with this new destination, I am confident Star Sports 1 Telugu will help fans watch their favourite sport in their language, starting with our home games here,” he said. CSK vs SRH: Can Sunrisers storm Kings’ citadel?